FUKUOKA - Yokozuna Hakuho reached a milestone Tuesday, picking up his 1,000th career win by defeating No. 2 maegashira Kaisei on the third day of the Kyushu Grand Sumo Tournament. 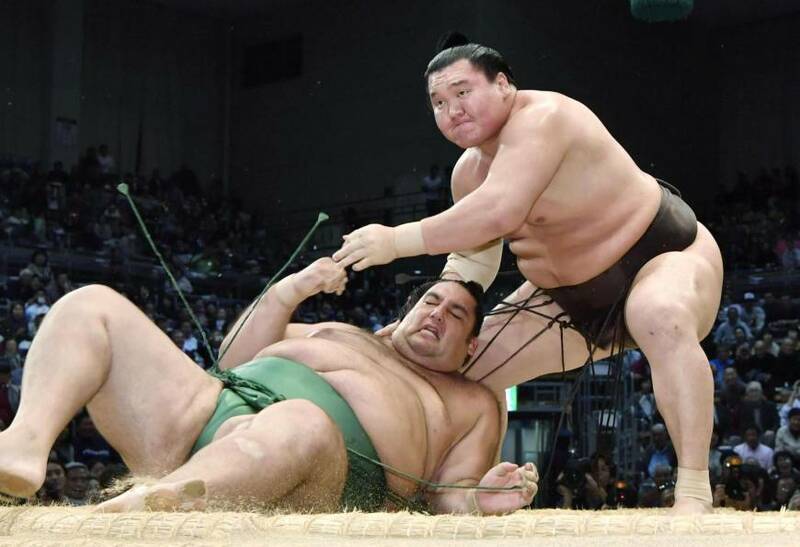 In the day’s final bout, Hakuho and Kaisei got into a tussle in a bear hug before the yokozuna delivered a strong arm throw, sending the winless Brazilian twirling down onto the ground at Fukuoka Kokusai Center. Hakuho had finished the Nagoya tourney in July with a 10-5 record and sat out the entire Autumn Basho two months ago with injuries. “Two great sumo wrestlers had reached 1,000 wins, and of them, I had fought against Kaio on the dohyo and thought it was amazing when he achieved the feat (in 2010). At that time, I never thought I would be the third one,” Hakuho said. Goeido, who won the Autumn Tournament for his first-ever championship, remained on course toward promotion to the highest rank of yokozuna as he delivered powerful thrusts against Yoshikaze, looking visibly surprised when his opponent suddenly fell onto his knees. 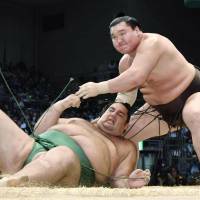 Kakuryu needed a little time against top maegashira Aoiyama, but eventually edged the giant out of the ring to his third loss in a row, while Harumafuji picked up his second straight win after heaving off top maegashira Tochiozan (0-3).